For every minute after a Sudden Cardiac Arrest, your chances of recovery drop by 10%. The average ambulance response time is over eleven minutes, outside of a hospital, the survival rate is less than one in ten. A defibrillator or AED is the only known treatment method but do you know how to use a defibrillator? 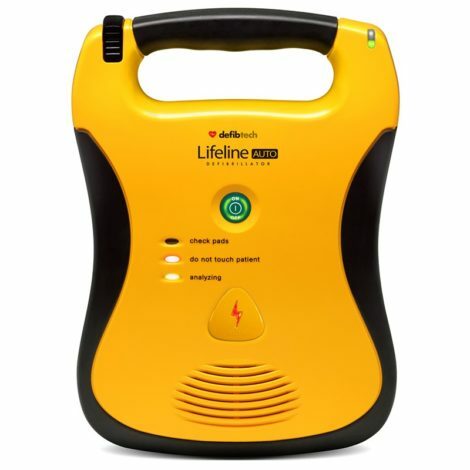 If a defibrillator is used within the first minute, you have a 90% chance of surviving – within three minutes, it’s 70%. 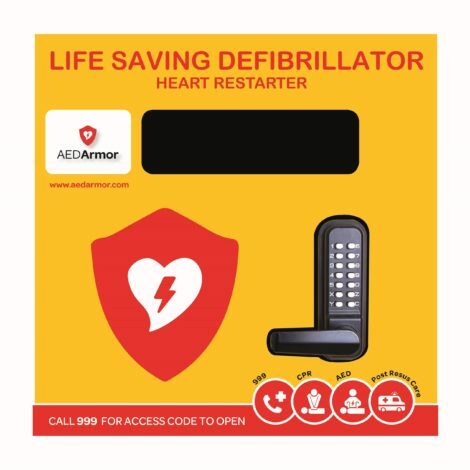 This is why more and more workplaces, schools, sports venues and tourist locations are providing access to defibrillators, also known as Automatic External Defibrillators (AEDs). 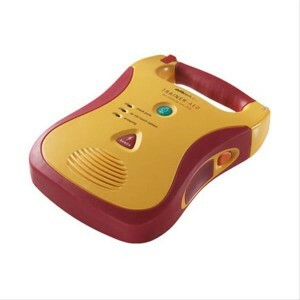 Defibrillators are designed to be as simple to use as possible. Anybody can save a life in the event of an emergency, you don’t need to have a medical background or any special training. The unit will analyse and assess the victim’s heart rhythm and, if needed, deliver a controlled electric shock to the chest to help pump blood normally again. 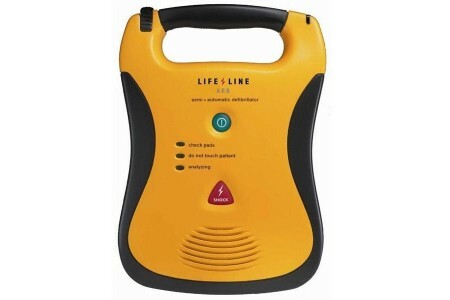 You can rely on the AED to make all the decisions for you and guide you through the process step by step. You can’t make a mistake – it’s impossible to shock someone who isn’t having a cardiac arrest. 1. If you suspect a Sudden Cardiac Arrest and the patient is unresponsive, your first action should be to call for help. 2. Get someone to call the emergency service, make sure the patient’s airways are open so that they can breathe and immediately begin CPR. CPR is essential to keep oxygen flowing to the brain. 3. While the emergency services head your way continue CPR and send someone to fetch the AED. 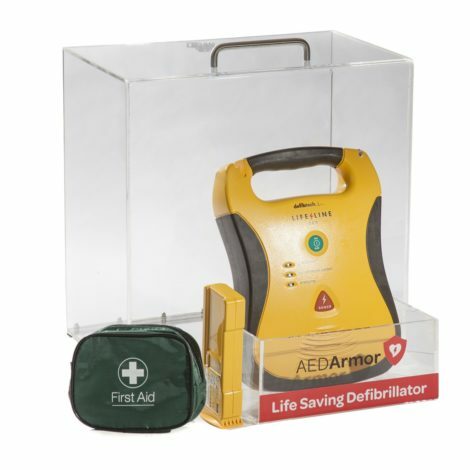 If the defibrillator is kept in a fixed location with eye-catching storage, it will be easy to locate in the panic of an emergency situation. 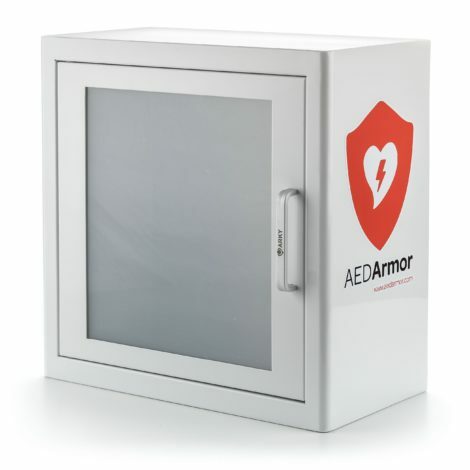 Some cabinets are also heated and secured so that you can be sure the AED is always kept in rescue-ready condition. 4. Administer CPR to the patient until the AED is attached. 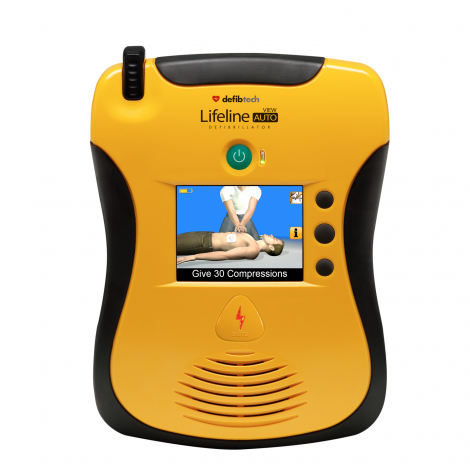 There are devices available that will help to make sure your CPR technique is perfect with compressions at exactly the right depth. 5. Attach the AED. This will assess the heartbeat rhythm and decide whether a shock is necessary. If it isn’t, continue with CPR until breathing is normal. 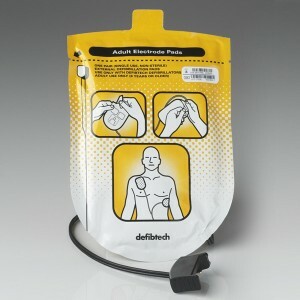 If the patient does require a shock, just follow the instructions on the unit and administer CPR when required. 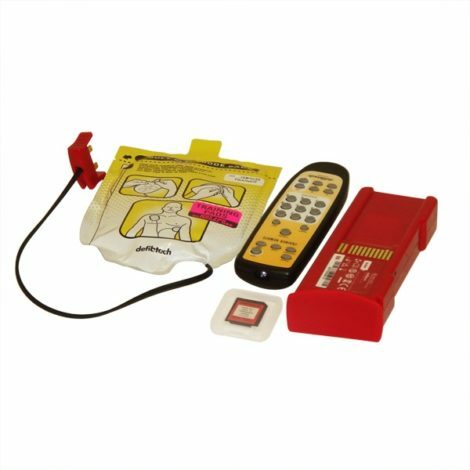 While models may differ slightly, all AEDs should be simple to operate and provide you with clear instructions. 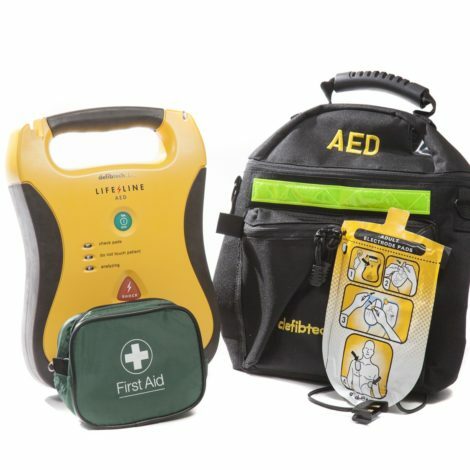 The components below are taken from our range of Lifeline AEDs which have been proven in independent studies to be the easiest to use on the market. When the unit is off, this indicator blinks green to indicate the unit is fully operational and red to display if the unit needs attention. A large button in the centre of the unit. This provides voice prompts when the AED is activated. It also emits a beep when the unit is in standby mode and has detected a condition that requires attention. This flashes green when the AED is analysing the patient’s ECG rhythm. 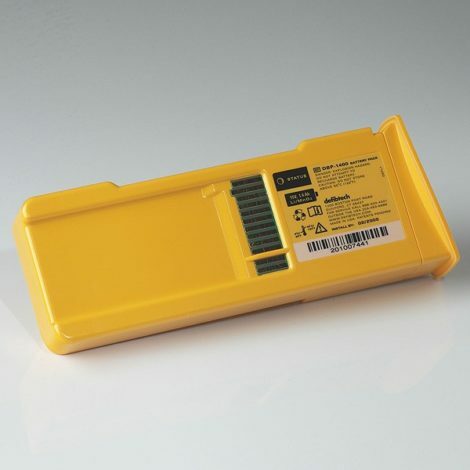 This flashes red when the AED detects movement or interference that prevents analysis of the signal or when the user should not touch the patient. 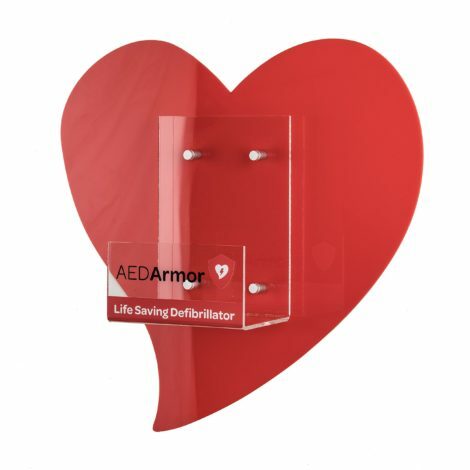 This red LED flashes if the AED detects that the pads connection to the patient is poor or if the pads are not applied. This flashes when a shock is recommended and is disabled at all other times. 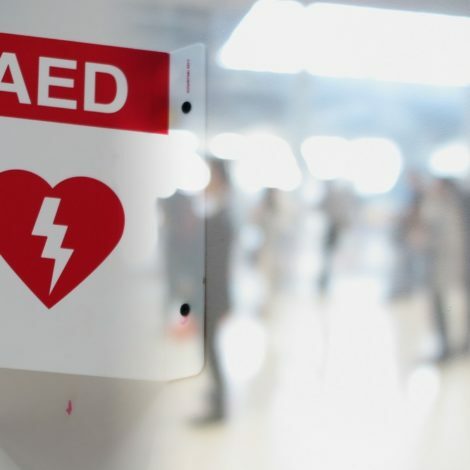 However unintimidating and easy an AED is to operate, non-medically trained personnel may still be in a state of panic during an emergency situation. For this reason, we offer a range of training to provide peace of mind. 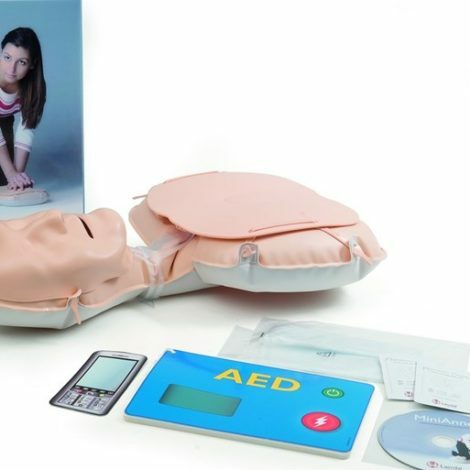 Our Bronze package can provide you with virtual training from a Martek Lifecare representative so that you become confident with using an AED. With the Silver package, you’ll receive certified on-site CPR and AED training. The Gold package gives you six hours of training to the standard of TQUK Level 3 emergency first aid at work (RFQ) which is a 3 year accredited qualification. 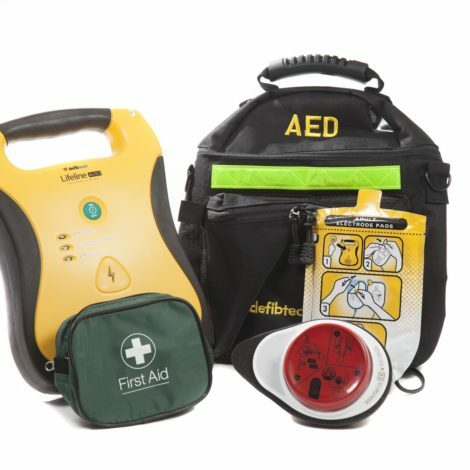 We also have a range of equipment tailor-made for training, including defibrillator pads, CPR manikins, training specific AEDs and conversion kits that will allow your existing defibrillator to be temporarily adapted for training purposes. If you’d like to find out more about our defibrillators or the range of training options we can offer, please contact us.